If you love football as much as my husband Lulu does, and also happen to be a 49ers fan, you were probably frantically jumping up and down and screaming for joy as they made it to the Super Bowl last week. Lulu has been looking forward to this since they lost in overtime in last year's NFC Championship game. To be honest, I have no clue what any of those words mean, but I've heard Lulu say them on several occasions. What I do know is food and I've concocted a week's worth of recipe ideas in honor of the Superbowl and the San Franciso 49ers. I may not know a first down from a field goal, but preparing fun party food for friends and family is a great way for me to get involved. To kickoff our week of SF-friendly Super Bowl foods, here's a combination of California rolls (avocado crab cucumber) and tuna (freshly caught by our neighbor Tom) and salmon sushi. 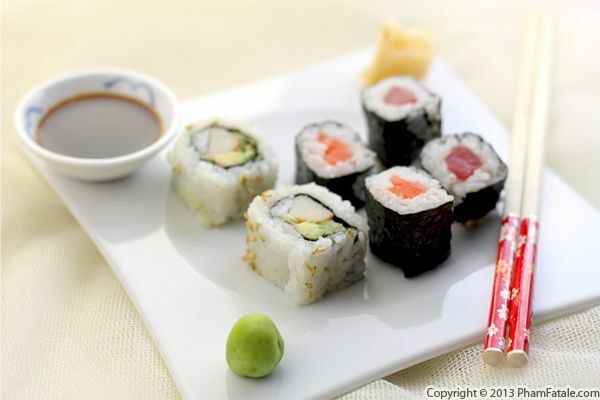 It's super easy; all you need is fresh ingredients and ready-cooked sushi rice. You can make several rolls in advance, and cut them throughout the party as your guests work their way through them. The other nice thing about sushi as party food is that you can easily make different fillings depending on you and your guests' preferences and dietary restrictions. 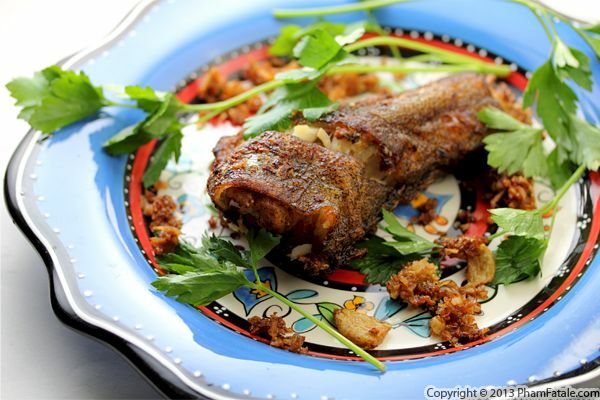 If you look back at the seafood recipes I've posted, you'll see that I love deep-fried fish. Whenever fresh pieces are available at the market, I don't hesitate to cook one to golden perfection, and today I found a beautiful yellowtail kingfish. I marinated it with a lot of fresh garlic, ground fennel, soy sauce, parsley and lemon juice, then transferred it into a combination of garlic powder and flour. The whole fish was pan-fried until crispy golden and placed on quenelles of smoky, spiced eggplant mash. I accompanied the kingfish with sautéed angel hair pasta. Making this dish is effortless and doesn't require a lot of time. 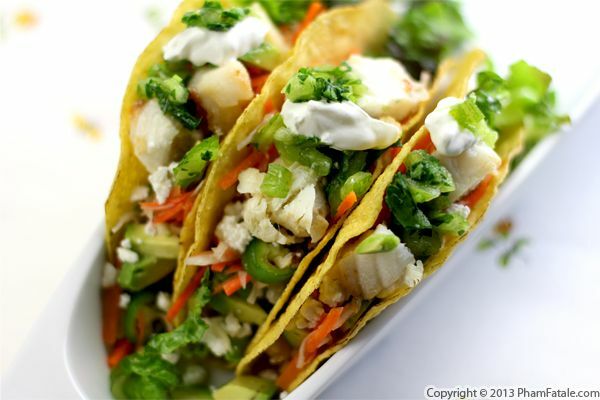 Enjoy the bounty of seafood that's available at your local market! Yesterday was a day filled with special events. As you may know, it was Martin Luther King Jr. Day and Inauguration Day and I made sure the entire festivities were recorded on my DVR. But if you’re involved in the specialty food business, yesterday was important for another reason. 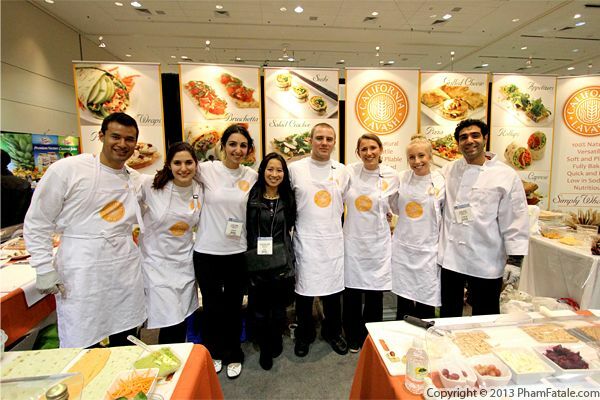 It was the second day of the Winter Fancy Food Show at Moscone Center in San Francisco. It's the second year in a row I’ve attended this event, and I've had so much fun discovering what the latest food trends are. I can't wait to share with you what I've learned! I also met the manufacturers of some of my favorite products, such as California Lavash. They are a bread company that just went through a beautiful design makeover in which I participated. It was great to see Lilea and the California Lavash team at booth #503 (you can still see them today), and I was so proud of how the backdrop turned out. I food-styled all the dishes and the photos were my contribution to the new look of this delicious product. It seemed only fitting to share one of the delicious sandwiches featured at the California Lavash booth. I selected the tuna melt, which is perfect choice for the season. 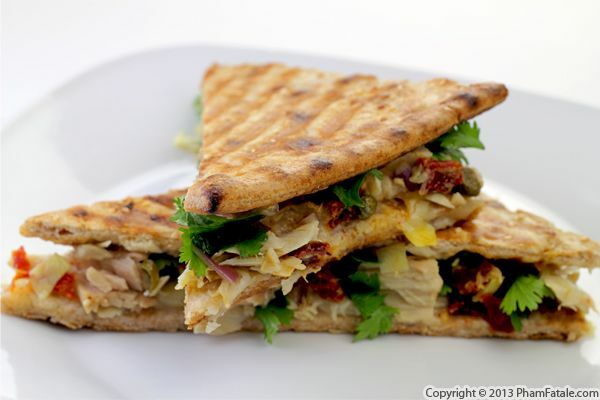 A combination of tuna, artichoke, olives and cheese is the filling of the delicious warm sandwich. Give this a try with California Lavash Sangak bread and you won't be disappointed! Sangak bread is a sesame-studded Persian bread that is part of their new flatbread product line. You'll be able to see the new packaging design in stores in a few months. This fish is called "cá chỉ vàng", which literally translates to "golden thread fish". 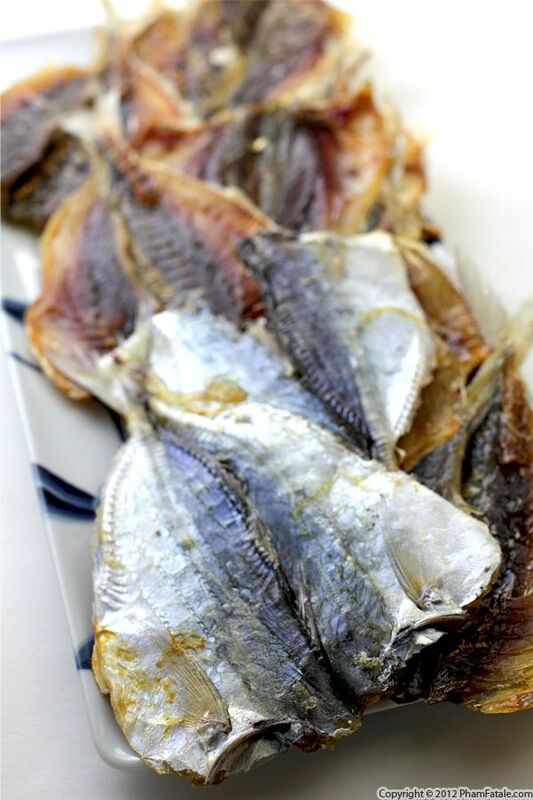 It tastes sweet and the texture is similar to a flattened sardine. It's not the easiest product to find, but if you come across it, you have to give this a try! The preparation is ultra simple. All you need to do is re-hydrate it overnight and pan-fry it the next day with a little garlic. I've been struggling to get back into a routine since returning from our trip to Paris, so easy, flavorful dishes like this are really helpful to know. Page 10 of 13 pages.